Right At Home Daycare provides quality child care services at affordable prices. We are open Monday to Friday from 7:30am to 6:30pm. RAHD closes at 5:30pm all summer Fridays. Rates include breakfast, hot lunch, snacks, juice, water and milk. There is a $70 one-time, per family, non-refundable RAHD Registration Fee. Our Infant/Toddler area provides our littlest RAHD kids with a warm and loving environment in which to grow and develop. Our infants are provided with loving arms, music and room to explore. Our Toddlers are given opportunities to hear wonderful stories and experience textures of life, music and dance. Our Littles are ready to take on the world and RAHD provides them with the tools necessary to get the job done. Through literature, music, dance, fine and gross motor stimulation, our RAHD Littles learn about themselves and the world around them in a safe and nurturing environment. They color, paint, run, jump, sing and smile all day long while refining their social and interactive skills. Our Middles are stepping it up a level and beginning their adventure into education by learning to cut, color and paste. They enjoy song and dance, poems and stories daily, all in a home-like happy and safe setting. Over the years, our RAHD Middles have shown great interest in learing to print their names, count each day﻿ everything from the seeds in apples to how many children are in their group ! Our Middles learn at their own pace and love to challenge their teachers to take them even further than expected for their young age group! They find each day an adventure in growing and learning. Our Pre-K group is eager to begin their academic journey! They learn to salute their flag, walk on line, print their names, learn their birthdates and so much more. Our 4's "learn by doing" as they plant, cook and paint while incorporating basic skills into their daily RAHD routine. Two days each week of the school year, our RAHD Pre-Ks participate in an afternoon Pre-K Extended day Enrichment Program. This program builds on the skills our Pre-Ks work on each morning by allowing them more time to explore and engage in academic and creative learning experiences. Right At Home Daycare is located along the bus route for Clinton Township Public Schools and so is able to provide before and after school care for children from Clinton Township. 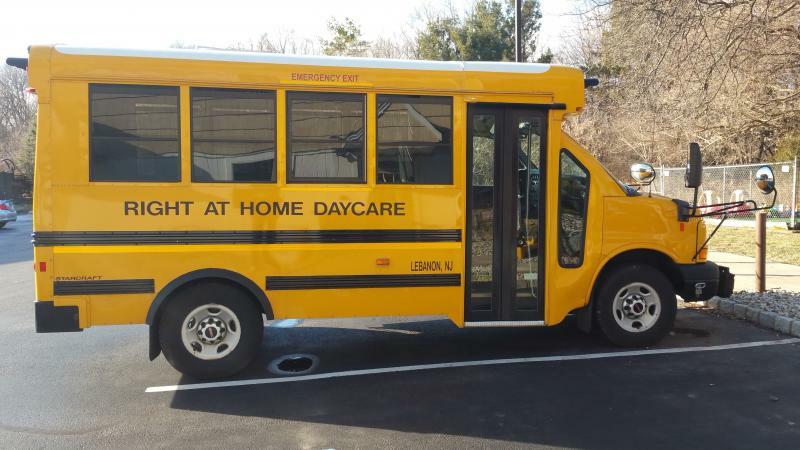 Also, we provide transportation with our own RAHD16 passenger bus to and from the Lebanon Borough Public School and most Readington Township Schools in connection with before and after care at Right At Home Daycare.>Please call us for specific program details and pricing.